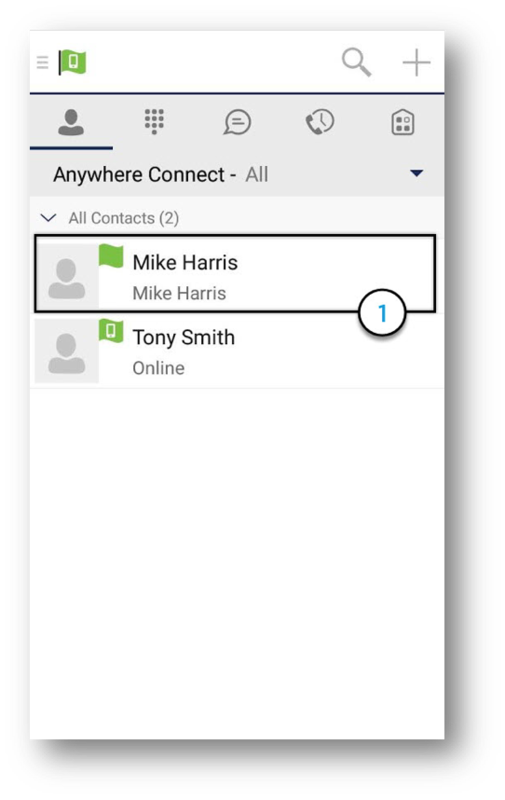 The Contacts tab can contain presence-enabled contacts and non presence-enabled contacts. 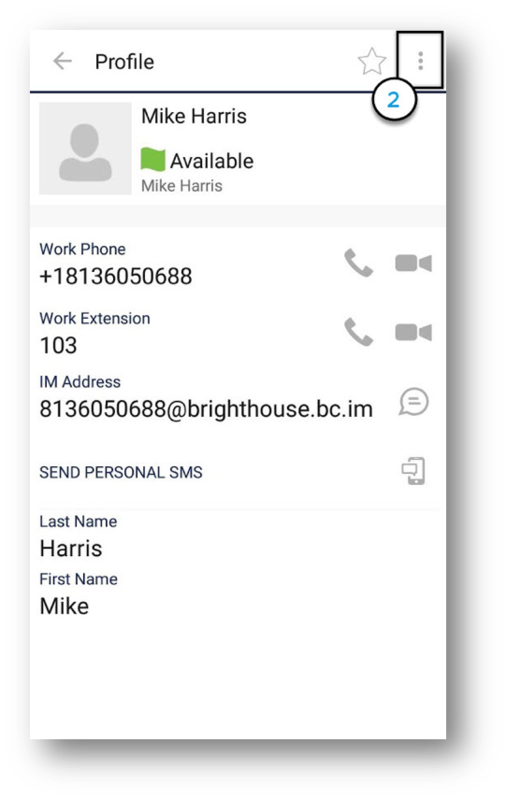 Presence-enabled contacts are users with an Extensible Messaging and Presence Protocol (XMPP) address. These can be other Anywhere Connect users or users from federated systems such as Google Talk. Non presence-enabled contacts can be phone or conference numbers. 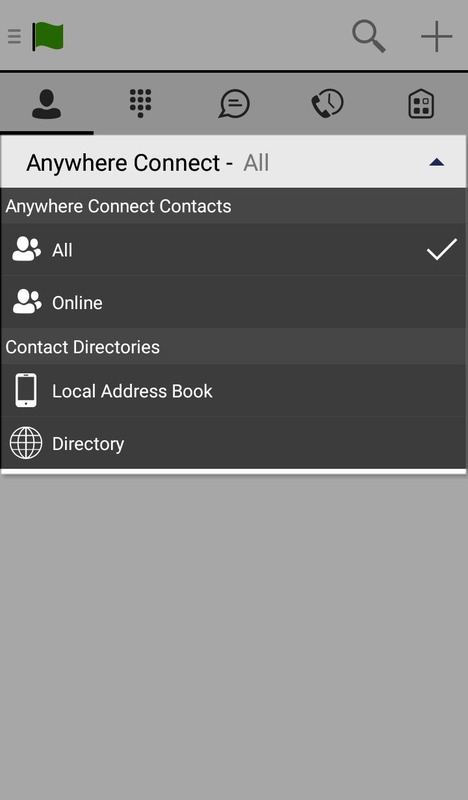 The Contacts tab also contains local contacts and directory contacts. Directory provides the company directory contacts. 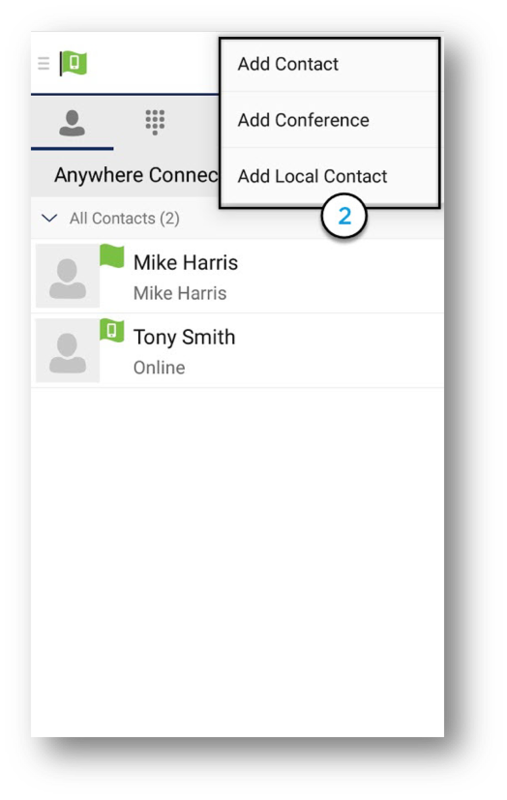 This guide will give you an overview of how to add and edit contacts in your Anywhere Connect mobile application. 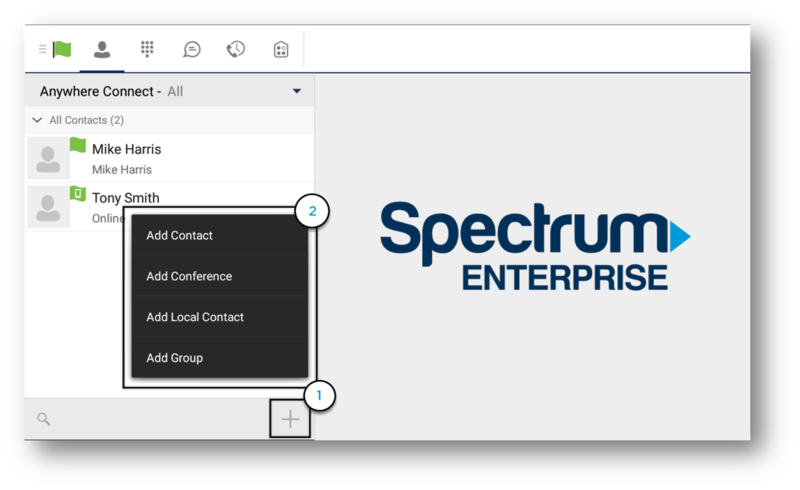 Presence-enabled contacts – Users within your organization who also have Anywhere Connect. Non presence-enabled contacts – Contacts can be phone or conference numbers. From the Contacts window, select the Plus icon. Then, tap one of the following options: Add Contact, Add Conference or Add Local Contact. 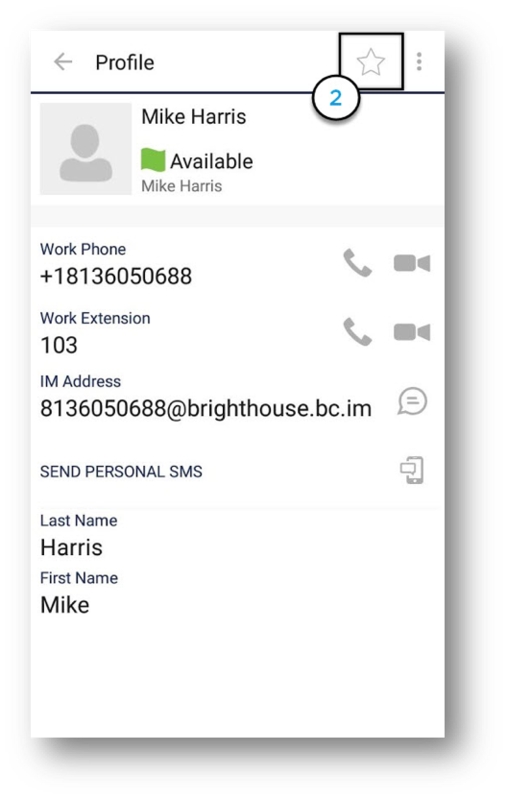 Note: Add Local Contact is used to access contacts found in your company directory or other local address books and requires Anywhere Connect to have access to the local address book. Once added, you can select on the Contacts tab to view the contact. 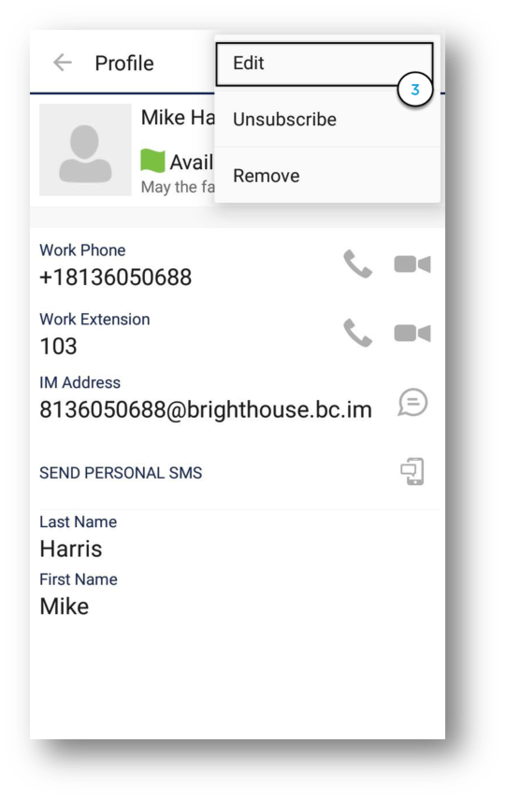 Android Tablet – To add a contact on your Android Tablet, follow the same steps, using the Plus icon located at the bottom of the Contacts window. To set a contact as a Favorite, select a contact from the Contacts window. Then, tap the Star icon. Android Tablet – Follow the same steps to set a Favorite on your Android Tablet. The contact’s profile will appear. Within this window, select the Options icon. Edit opens the Contact Information dialog box where you can add, edit, or remove information. This works for both presence-enabled and non-presence-enabled contacts. Unsubscribe removes the presence relationship between you and that contact. This means you do not see the contact’s presence information and your contact does not see yours. Select Subscribe to re-establish the presence relationship. An unsubscribed contact remains on your Contacts list and is always shown as “offline”. Remove removes the contact from your Contacts list. Note: This feature is unavailable for Anywhere Connect users who have a Skype4Business profile. ©2018 Charter Communications. All Rights Reserved. Not all products, pricing and services are available in all areas. Pricing and actual speeds may vary. Restrictions may apply. Subject to change without notice.